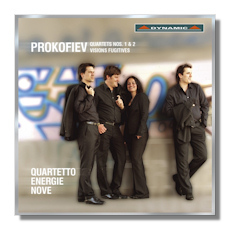 This appears to be the first recording from the Quartetto Energie Nove, a group consisting of principal players from the Orchestra della Svizzera Italiana, based in Lugano, Switzerland (Hans Liviabella & Barbara Ciannamea, violins; Ivan Vukcevic, viola; and Felix Vogelsang, cello). The biographical information provided in the Dynamic album booklet does not divulge the date of the group's formation, but it was apparently fairly recent. The members all appear to be young, perhaps in their early thirties, but all perform as part of a seasoned ensemble, with a good collective sense of their own individual sonic and interpretive style. In general the QEN play with an impressive technique, a crispness in their attacks, very accurate intonation, and with an unsentimental approach in lyrical sections. Long lines can sound songful or fluent alright, but the players generally don't linger over them or convey a strong sense of warmth or sumptuousness. The QEN deliver fairly brisk performances of the Prokofiev Quartets here, but the tempos work just fine. In the more energetic music of #1's first two movements and the outer movements of #2, their livelier and faster tempos infuse a vitality to the music that is quite necessary to bring it off effectively. Most of the music in these quartets is light but not necessary joyful. Of course, the complex and dark finale of the First is anything but light and, moreover, there isn't even a glimmer of joy in it. Indeed, but for all its gloom it is arguably one of the most profound chamber creations ever written by Prokofiev. In the First Quartet (1930) the QEN appropriately impart an athletic character to the first movement, and while they maintain a mostly light mood in the second movement, they deftly capture the somewhat darkening sense of the music. Their finale is filled with tension and grimness, but unlike some groups they make no attempt to soften the music's unyielding sense of quiet desperation, of its inexorable descent to a decidedly unhappy conclusion. The Second Quartet (1941) aptly comes across as happy, confident, ebullient – and, in the second movement, colorfully exotic. Prokofiev rarely relied on folk sources in his works, but in this quartet he employs an array of folk themes of Kabardin Balkar origin. In this fine performance by the QEN the first movement is appropriately chipper and rugged, while the second movement, with that catchy, exotic main theme, is unforgettable. The finale has the necessary joyful bounce and playful menace in the outer sections, as well as a sense of harrowing sadness in the middle section, perhaps the only truly grim moment in this otherwise cheerful quartet. You wonder sometimes how Prokofiev could write such generally happy music at this time: his country was at war and he, Shostakovich and other major Soviet composers had been relocated from the war zones to Nalchik, part of the Kabardino-Balkar Republic. There these composers wrote various works including some patriotic music. The arrangement of the Visions Fugitives (1915-17), a work of twenty short piano pieces that has become one of Prokofiev's more popular keyboard collections, is a reasonably imaginative effort here. Many may be unaware that Prokofiev originally intended the Visions Fugitives for orchestra, but never made an orchestral version. Musicologists and critics have typically seemed wary of non-keyboard versions of the work, believing it utterly native to the piano, quite the opposite of Pictures at an Exhibition, which seems to call out for orchestral treatment. Rudolf Barshai fashioned a string orchestra rendition of Visions Fugitives and Walter Susskind made an orchestral version. This quartet arrangement was fashioned by Sergei Samsonov. Throughout the work the QEN play with somewhat less brisk tempos than in the quartets: a typical piano performance of the work lasts about twenty-two minutes, but here the timing is just over twenty-five. Thus, Prokofiev's lyrical moments here are milked a little more than you might expect, most notably in Nos. 1, 7, 17, 18 and 20. Also, the livelier music is often less headlong, as in Nos. 3, 6, 8 and 11). Many numbers stand out in this performance: Nos. 4 and 15 are especially vehement and driven; #5 is deliciously tart and blunt; #9 is delightfully sassy and playful; #16 is powerfully atmospheric in its mystery and mournfulness; and #19 is frenzied and fearful, but a joy to hear! All in all, this work makes a fine filler on the disc. The sound is very close-up and vivid, but be aware that at higher volume levels the instruments can sometimes sound shrill. The notes are informative. There have been excellent performances of the Prokofiev quartets by the Chiligirian Quartet (Chandos CHAN8929, but with no filler), the Aurora Quartet (Naxos 8.553136), and among older recordings, the Novak Quartet (Philips) and Britten Quartet (the now defunct Collins Classics 1189-2). This one on Dynamic is at least is as good as the best of them and has an interesting bonus in the addition of the Visions Fugitives arrangement.